There are many software tools for digital painting in the world. Their visual possibilities are enormous but do you experience the feeling of wonder when color runs freely over handmade paper or when the drops of color unexpectedly run in different directions? That feeling when the color gradually changes its look and you are the director of a theater of colors and shapes? With Rebelle 3 you can experience this feeling. Painting in Rebelle can be a crazy game of water, paint, air and creative tools. Entertainment can start very simply by painting a wet watercolor stain and blowing it in different directions. You can set the blow length, drip size, amount of water or simply forget about everything, wandering with your stylus or finger on the touch screen and letting yourself drift by the beauty. If you’re longing for more, you can tilt the canvas and the colors will run in the direction you choose – even against Earth’s gravity. At the same time, Rebelle 3 is highly professional software with a focus on detail. Unlike traditional watercolor painting, it allows greater expression, variability and better control over the creative process. Every traditional artist knows how easily a paper can get damaged unintentionally. Rebelle 3 solves these problems by reacting very sensitively to each new layer of color with a paper or canvas. Painting is fresh and light even after many overlays. In Rebelle, you can lay wet, damp or dry layers and layers with flowing drips and have everything under control without any undesirable effects. The sample below shows the realism of Rebelle digital watercolors alongside real-world watercolors. The papers and canvas really seem to come alive. Recently introduced ultra-realistic papers and canvases also offer an additional unusual experience for your painting. The selection of papers in Rebelle is proven by centuries-long artistic practice. You can use not only the classic hot-pressed, cold-pressed or rough papers, but also rare Japanese Washi papers from the bark of the Kozo, Mitsumata and Gampi plants. If you would like something special, hand-made cotton watercolor papers made in cylindrical form and many exotic papers made of plants such as kenaf, elbow and yucca await your creative vision. Real papers always have typical characteristics – a specific size, structure or color. Papers in Rebelle allow more variability. You can adjust the water absorption, paper texture density, roughness, color or structure visibility. The unique feature of the papers are the deckled edges of waving natural fibers. 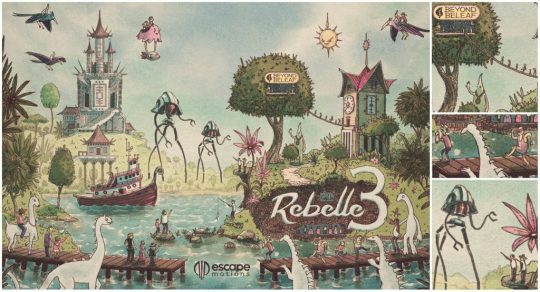 Rebelle 3 can be a game software as well as a strictly rational creation tool. You can use not only watercolors but also experiment with acrylics, pastels, inks, classic pencils and other handy tools. Rebelle’s unique approach for perspective drawing allows you to draw by ruler, but the line remains very natural with slight variations. 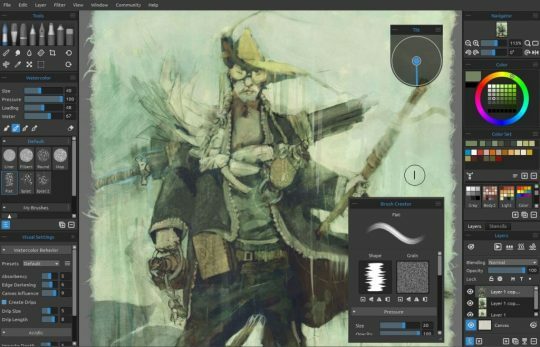 It is a perfect tool for painters, illustrators and designers. 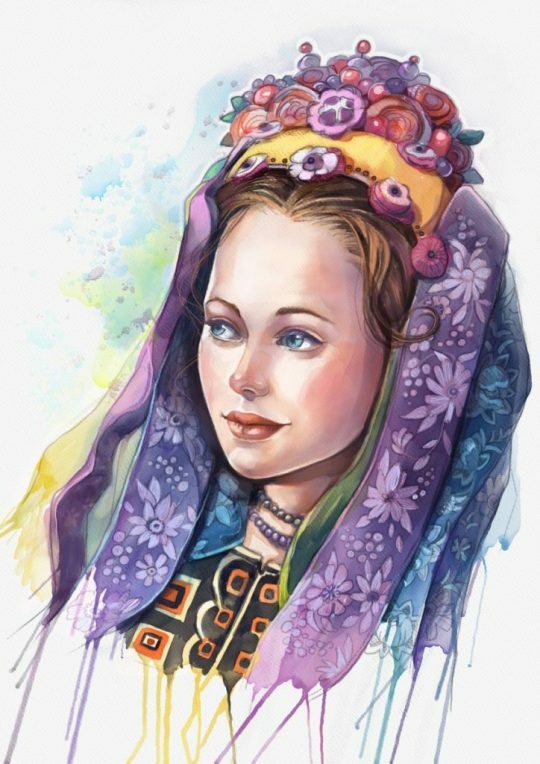 Creation of decorative elements for illustration, textile designs, painting textures – everything is a part of the moment. Available stencil tools allow creating a template from any imported image. You can then simply duplicate it, modify the shape, or tile it over the canvas. Painting through the stencil can be accurate (marker), dispersed (watercolor), or pasty (acrylic). Rebelle 3 is the digital equivalent of real art materials and tools. However, it adds more variability and more control over creative workflow. It is a balanced harmony between creative play and deliberate rational creative process. 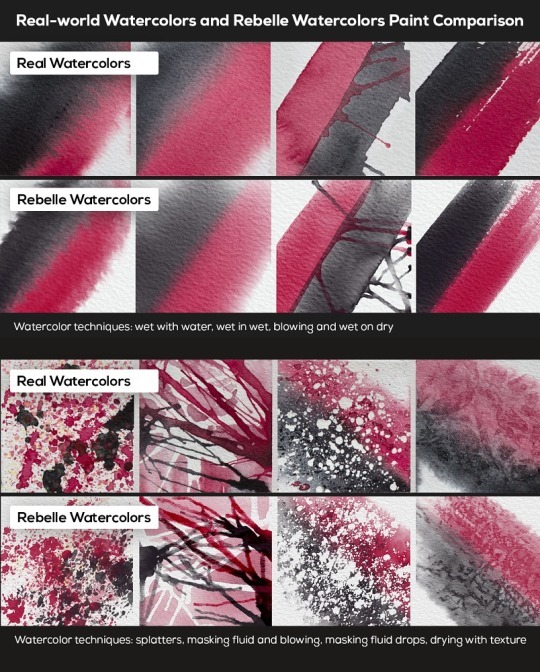 Rebelle is having the elements of water, air, paint and creative tools under your control. Author Mgr. Ľubomír ZABADAL, PhD is an expert for traditional art media and assistant professor at Department Of Creative Arts and Art Education at UKF University, Slovakia.